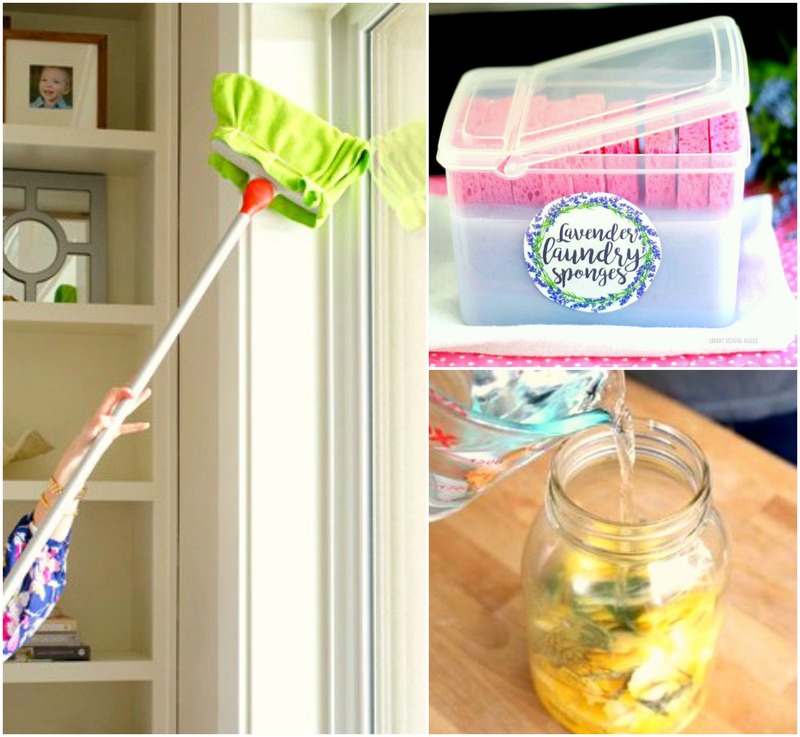 These cleaning hacks are some of the most helpful and easy ways to keep your home tidy! So if you’re wanting to get your home under control, then these will definitely save you time! So check out the cleaning tips and tricks that I’ve found from awesome bloggers below, and be sure to take a look at the tutorials on the original page! A great way to disinfect your sponges is to microwave them on high for 1 minute. And an added benefit to this hack? The water in the sponge is released and moistens the dried food on the sides of your microwave (yes for easy cleaning!). If you turn your AC on before dusting, any floating dust particles that get knocked up into the air will be sucked into the filter, and leave you with cleaner air to breath. If you have a lot of gross soap scum build-up, a great way to get rid of it is with a halved grapefruit and salt. The citric acid and the rough salt will get it up right away! If you want any easy way to dust high and hard to get places, attach a microfiber cloth to a broom with a rubber band. No need to strain yourself. Ever notice how the fans in bathrooms can get seriously dusty? It’s a bit of an eyesore to say the least. But with canned air, you can get rid of it fast and easy (also, it doesn’t cost much either). When dusting, make sure to get the light bulbs! A lot of the time, people don’t clean them and end up having a more dimly lit room because of it. If you hate cleaning your home because it takes so long to complete, then I hope these hacks help you hate it a little less. Seriously, nobody likes doing it, but at least we can shave off some hours when house cleaning. No sense in wasting your time when you could be relaxing in a freshly clean home with a cup of coffee! Now if you have any questions on cleaning hacks and tips, let me know in the comments down below! I’d love to hear about them! I use a small short bristle paint brush to dust lamp shades, the crevices of knick knacks, tops and around edges of books and other intricate or tight spaces. I use an old toothbrush for cleaning round taps and little corners on the stove tap. Write on the handle in black permanent marker that the brush is for cleaning only !